In 2013, Garner voters overwhelmingly backed an ambitious bond program authorizing the town to borrow up to $35.7 million for an array of much-needed projects. The completion of the bond program over the next several years will enhance the quality of life and level of services in Garner and facilitate economic development for many years to come. Garner is the only jurisdiction in the United States to boast nationally accredited police, public works and parks and recreation departments and have an All-America City Award that was earned since 2000. A town with that superior level of service and citizen engagement needs facilities, amenities and infrastructure to match. 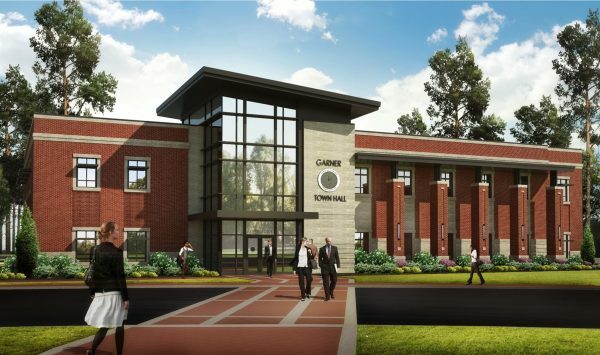 That’s why one of the major projects in the Garner bond program was a new, state-of-the-art police station that brought all of the Police Department under one roof when it opened in December 2015. Two other big-ticket bond projects are a new 26,000-square-foot Town Hall, slated for completion in the summer of 2017, and a 40,000-square-foot recreation center with three high-school-size basketball courts, an elevated indoor walking track and rooms suitable for a variety of programming. The center, to be located on Main Street, will help boost the revitalization of Garner’s downtown when it is completed in late 2017. The bond program has so far funded a number of other well-received projects, including two dog parks, new concessions buildings at ballfields, a mobile stage for special events and several sidewalk installations. In the coming years, bond proceeds will fund enhancements on the Garner Performing Arts Center campus, additional sidewalk projects and possible greenways. Garner’s bond program assures that, as the town embarks on a new era of fiscally responsible and orderly growth, there will be the facilities, amenities and infrastructure needed to continue to make Garner a great place to be. More information about Garner’s bond program can be found at garnerbonds.com.